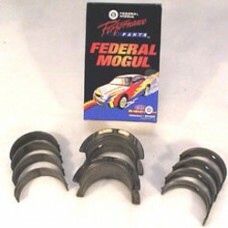 Federal Mogul is the world’s leading supplier of engine bearings, with unmatched technical and manufacturing expertise. These competition series bearings have the latest in high tech designs, using exclusive materials specifically created for the extreme loads found in racing. Competition bearings feature H-14 overlay material on a high strength 1020 AK steel backing for unsurpassed durability. Main sets feature a patented contour flange design and 3/4 groove to enhance lubrication and increase load capacity. Federal Mogul bearings have proven themselves many times in NHRA, NASCAR and IHRA classes. Competition series main bearings with 3/4 groove, constructed from Super Duty Alloy. Application: Small Block Chevrolet 302, 305, 307, 350 and stroker engines using 350 style bearings. Size: 0.001” grind – or to reduce bearing clearance on a standard crank.